We have a new addition to the Burger Of The Week line up - The Wild Thang! - Seasoned Grassfed Angus Patty with Wild Ketchup Chipotle, Fried Onion Rings, Cheddar Cheese and Applewood Smoked Bacon. We will also have our delicious Homemade Dessert Treats! Don't forget to follow us on twitter.com/fritesnmeats and facebook.com/fritesnmeats peeps! Also, We are using a great new program powered by MobileMeteor! You can view our website, fritesnmeats.com, via a smartphone. From there, a map will appear with our current location. You can also clearly view our blog for schedule and menu and rate your experience with us! We hope you were nice this year or if you were naughty, it was worth it ;). Last Wednesday was a special day, thanks to those who came out in support of City Harvest! Once again, we have yielded to the request of our fans! Over the last few months many folks have asked for a Hamburger with Hummus. 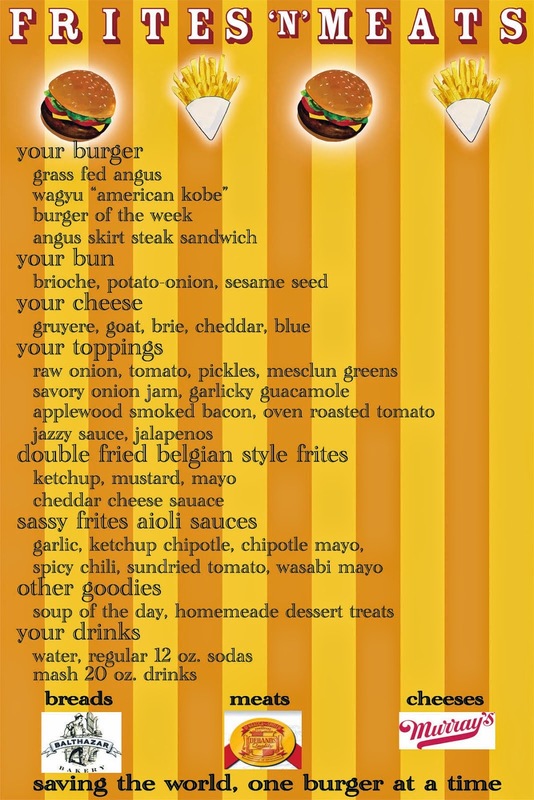 Hmmmm.....These are both delightful foods; our great Burgers and Hummus....interesting. So we dabbled and we played and we dabbled some more. What came about was the Zesty Hummus - Seasoned Grassfed Angus Patty with Hummus spread and marinated Onions and tomatos. It's gonna feel like there's a dance in your mouth. We think you Burger Lovers are gonna love this! No, we know know you're gonna love this! We will also have our delicious Homemade Dessert Treats and awesome soup to keep you warm this cold week! Folks, this Wednesday, 12/8, please help us help City Harvest. We will be serving up a rare treat - Kobe Hot Dogs, for a great cause! For every Kobe Hot Dog sold, $2 will be contributed to City Harvest to help feed those in need. If you cannot visit us to help support this great cause, click here to do so online.